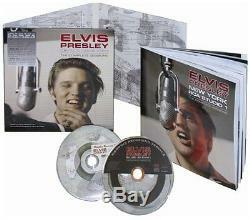 ELVIS PRESLEY: NEW YORK RCA STUDIO 1 THE COMPLETE SESSIONS. Mega-rare out of print collectible. For the serious Presley afficiondo only!! A superb Audio Visual release in high quality sound with special thanks to Alfred Wertheimer for rare and newly discovered photographs. CD contains 39 newly restored and remastered classic recordings including: Blue Suede Shoes, Hound Dog, My Baby Left Me, Session recordings, Interview, Previously Unreleased Material and 3 Bonus tracks. Bonus Disc: DVD-AUDIO 5.1/Dolby Digital The DVD-A version is remastered in high quality 24 bit 96 kHz sound. Experience these recordings in high quality sound for the first time ever. All tracks are accompanied by rare photographs. BONUS BOOK contains a stunning collection of rare and unpublished photographs by Alfred Wertheimer. Many more Presley items listed, Vinyl, CDs, DVDs, Books, Blu Rays!! The item "ELVIS New York RCA Studio 1 The Complete Sessions MRS CD/DVD Audio/Book Box Set" is in sale since Sunday, December 16, 2018. This item is in the category "Music\Music Memorabilia\Artists/ Groups\Elvis". The seller is "ikons_uk" and is located in Londonderry.